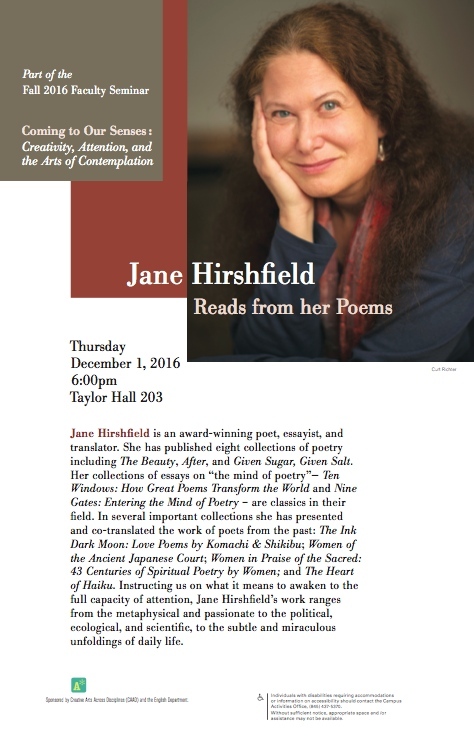 Jane Hirshfield, an award-winning poet, essayist, and translator, will deliver a public lecture at 6pm in Taylor 203. Instructing us on what it means to awaken to the full capacity of attention, Jane Hirschfield’s work ranges from the metaphysical and passionate to the political, ecological, and scientific, to the subtle and miraculous unfoldings of daily life. Among Hirshfield’s many honors are The Poetry Center Book Award; fellowships from the Guggenheim and Rockefeller Foundations, the National Endowment for the Arts, and the Academy of American Poets; Columbia University’s Translation Center Award; and the Commonwealth Club of California’s California Book Award. Her work has appeared in The New Yorker, The Atlantic, The Nation, Harper’s The American Poetry Review, Poetry, The Paris Review, McSweeney’s, Orion, eight volumes of The Best American Poetry (including the 25th anniversary Best of the Best American Poetry volume), and many other publications. In 2004, Hirshfield was awarded the 70th Academy Fellowship for Distinguished Poetic Achievement by the Academy of American Poets, an honor formerly held by such poets as Robert Frost, Ezra Pound, William Carlos Williams, and Elizabeth Bishop. In 2012, she was elected a chancellor of the Academy of American Poets, and also named the third recipient of the Donald Hall–Jane Kenyon Prize in American Poetry.